The impressive Tibumana Waterfall, located about 40 minutes from Ubud, is one of Bali's most stunning waterfalls. Luckily, it's also one of the quietest waterfalls in the area, meaning you and a few other lucky souls will have it all to yourselves. We hear it before we see it. The sound of rushing water fills the air, getting louder with every step. A fine mist rises through the emerald green forest, adding fine droplets to every leaf. 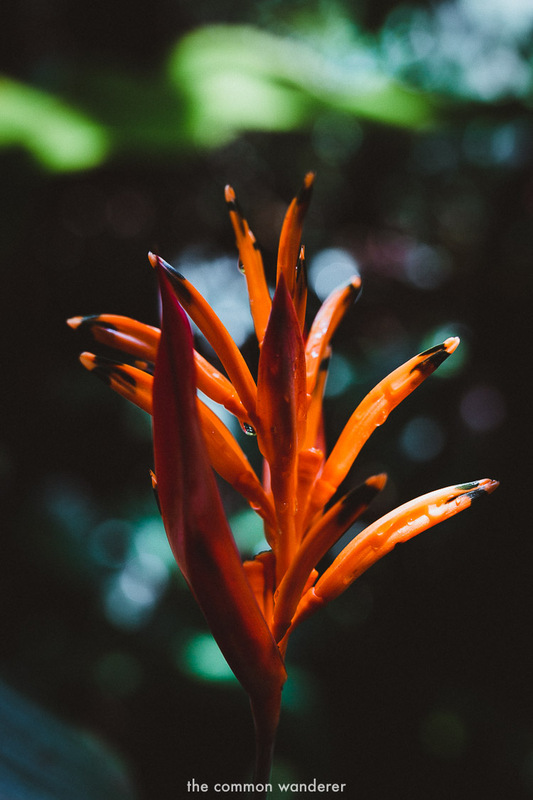 Colourful, exotic flowers line what feels like a pathway to heaven. After a short 10 minute walk, we arrive and finally lay eyes on today's nirvana, Tibumana Waterfall. Located around 40 minutes from the hustle and bustle of Ubud, Tibumana falls are a world away from the chaos of Bali's second largest city. We arrive early morning and make our way through the manicured pathways and dense forest to the falls. Cascading from the dense, green forest above, Tibumana Waterfall drops stunningly to the natural pool below, before continuing on its merry journey to the Bali sea. With the place almost to ourselves, we spend an hour admiring the stunning scene, as well as snapping a few obligatory photos (hey, we're photographers!). Unlike most of Bali's waterfalls, Tibumana is relatively quiet and peaceful, that is until 11am when the day tours start to roll in. But before then, it's almost all yours. While we would've loved to escape the sapping humidity with a swim under the falls, our visit coincided with wet season, so unfortunately the natural pool wasn't looking its best (ie. it was rather murky!). In season though, when the water's clean and the falls a shade of green/blue, it's possible to swim in the natural pool at the base of the falls. Just be careful, anything could come over the edge at anytime. While Tibumana Waterfall is stunningly beautiful, we do have to point out that unfortunately, like most places in Bali there's plastic pollution. On the walk down to the falls there was plastic in the waterways and gardens, which made the serene location feel a little tarnished. We recommend packing a spare tote (or plastic bag) and picking up some of the plastic on your return from the falls, and disposing at your hotel. Every little bit counts, and it's a good feeling to be a legendary human and know you’re doing your bit to keep Bali clean (read our guide on how to be a responsible and eco-friendly traveller here). 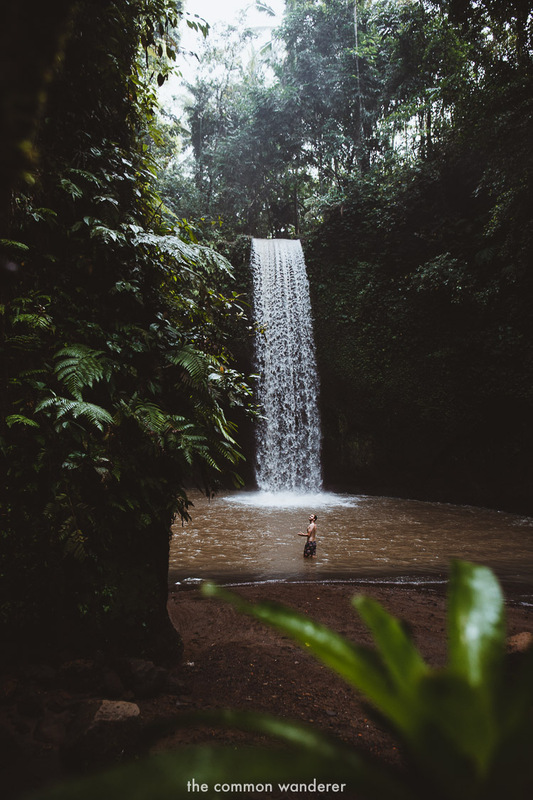 So if you’re convinced to see this incredible Bali waterfall, we’ve added all the essential Tibumana waterfall information below to help you find this gem, and enjoy it. From downtown Ubud it's around a 40 minute scooter ride to Tibumana Falls, making a visit the perfect half-day trip. The drive follows the the main road from Ubud to Gianyar or Samarapura, before veering off through some quintessentially Balinese villages. The closer you get to Tibumana the more impressive the scenery gets, with the windy, palm-lined roads passing rice terraces and through rainforest before finally arriving at falls. The road is very well sign posted from the village of Apuan all the way to the falls, however if you do get lost, ask a local who will be more than happy to help. From the carpark, it's an 10 minute walk along beautifully manicured walkways and thick forest vegetation to the falls. It's impossible to get lost - just follow the signs. Be prepared though, as there are quite a lot of stairs which can be a little slippery after rain, or in the early morning, so pack sneakers just in case. From Canggu, it's about a 1.5 hour ride/drive through the busy roads of Bali, so be prepared! If you’d prefer to see a number of Bali waterfalls, you can join this tour which takes in three of the most beautiful waterfalls around Ubud without the hassle of self-drive: Tibumana Waterfall, Tukad Cepung, concealed behind a cave, and Tegenungan Waterfall. Book your tour here. It’s also possible to hire a taxi from Ubud to Tibumana, which can be arranged in Ubud centre and should cost around 300,000 - 600,000 IDR depending on the trip and whether you chose to visit other sights and attractions in Ubud. In our opinion though, this is an overpriced option and should be a last resort. 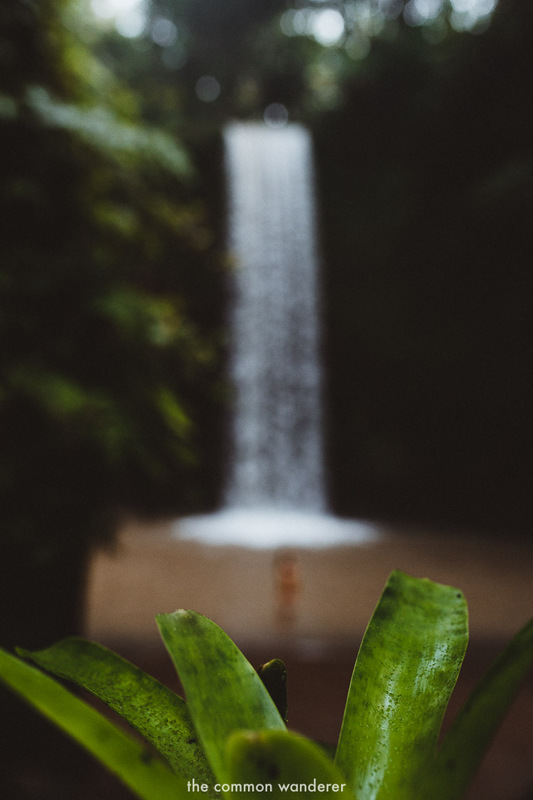 We've added a map of how to get to Tibumana Falls from both Ubud and Canggu below. Heading to Bali? Here’s our comprehensive guide to travel insurance! Entrance into Tibumana Waterfall is 15,000 IDR. Upon arrival, you will pass a ticket booth where you'll need to pay before entering the car park. Remember to keep your ticket incase you’re asked to provide evidence after parking. If you're looking to secure your gear, lockers at the base of the falls cost 5,000 IDR. Stress less peeps, Tibumana Waterfall is actually very well appointed when it comes to facilities. At the base of the falls there is a small change room and toilet where you can get changed or answer natures call. There are also storage lockers if you're looking to keep your valuables safe. For those unsure in the water, there is a life saver on duty throughout the day checking the safety of swimmers. At the car park there is a small cafe where you can buy food or beverages. We definitely advise against buying anything plastic as this ends up in the waterways across Bali. The cafe also has toilets which are available to use, however you will need to purchase something small to use these. Like with all major sites around the world, visiting earlier is better. If you want the place to yourself, we recommend arriving at the falls between 8am - 9am. Between 9am - 11am, it there are a few people that come and go, however after 11am the falls get quite busy with tour groups and day-trippers from Kuta, Seminyak and Canggu. If you're a photographer looking to visit the falls, the best light for us was also between 8am - 9am, when the sun lights up the trees above the falls with a golden glow. At the base of the falls, it can be a little dark, so be prepared to bump up the ISO. If you’ve got a wide lens, use it. We found our 24 - 70mm was almost too cropped, so if you’ve got a 16 - 35mm in your kit, it would be perfect for the falls (check out our camera gear here). There are a number of cool areas to shoot from around the falls, including the trees to the left of the path as you arrive. From there, you can ‘shoot through’ the dark green leaves to frame your shot perfectly. Alternatively, shooting wide, adding your subject in the middle of the falls and getting including the surrounding beauty is another great shot. Another cool and creative way to photograph Tibumana waterfall is via long exposure. As the water is falling so fast, you’ll only need to slow the shutter to 1/15 or so to give the waterfall that smooth, milky goodness. There’s enough space to get creative however you’ll need as few people as possible in the area, so get there early and shoot away. Read our travel photography tips guide here. Ubud is literally overflowing with incredible accommodation options for all budgets. Search pricing and availability for hotels in Ubud here. Alternatively, do what we did and book and Airbnb homestay, which should set you back no more than £20 per night. If you’re new to AirBnb (or even if you’re not), we’ve written a comprehensive guide to Airbnb to help you book the best, cheapest and safest accommodation, every time. Book using our code and receive up to £30 off your booking. Like this post? Pin and share it! Have you been to Tibumana Waterfall yourself? Help your fellow travellers our by sharing any tips in the comments below! Disclaimer: Some of the above links are affiliate links. If you choose to purchase using the above buttons we receive a small commission at no extra cost to you. Please know that by using these affiliate links, you’re directly supporting The Common Wanderer to stay wandering. If you use our affiliate code, you’re officially a legend.